The "Income" screen is for viewing and recording the income from sales of animal products including milk, eggs, meat, etc... Income is recorded by animal type or it can be for an individual animal. Entries can be recorded daily, but it is much easier to record the total usage weekly, bi-weekly or monthly. The recommended method is to record income in the system on the 15th and last day of each month, or as they occur. To add a new income item click on "+ Add New", to edit click on "Edit". The income entry screen will display. Income items are entered by animal type and can be entered for individual animals or as various animals. 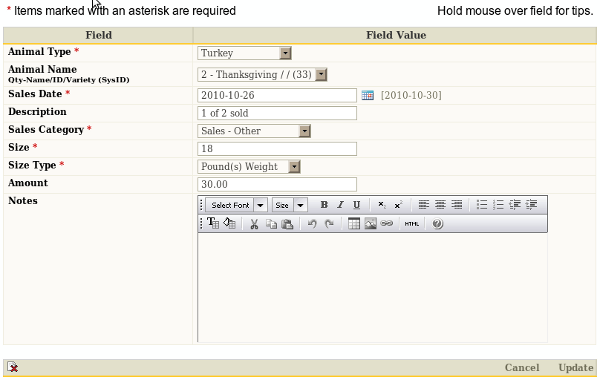 The example (above) records the sale of one of two turkeys listed in the "Main Animal" entry screen. The sale should also be listed in the "Main Animal" entry screen without marking the departure date, but it should be placed in the notes until all the turkeys are sold. Large items or groups of animals for meat could be split by products or dates for sales. If a single item is being sold, then the departure date should be listed in the "Main Animal"section if the sale relates to one animal. Animal Type (Required entry) Select an animal type from the drop down list. Most common animals are listed. Select "Other" if the desired animal type is not listed. Animal Name Enter the animal's name. Sales Date (Required entry) Select the date of the sale. Description (Recommended entry) Enter descriptions such as weekly total, 1/2 items sold, etc... The maximum length of this field is 60 characters. Sales Category (Required entry) Select the income category. Size (Required entry) Enter the size or quantity of the type specified in the "Size Type" field. In the example (above) 18 pounds are entered. Size Type (Required entry) Select the size type or quantity measurement. Amount (Required entry) Enter the Income amount received for the sale.